We’d love your help. Let us know what’s wrong with this preview of Penny and Her Doll by Kevin Henkes. To ask other readers questions about Penny and Her Doll, please sign up. Plot summary: Penny recieves and new doll and has trouble finding the perfect name for her. As an early reader, this book presents a basic problem and solution structure. The middle part where everyone is offering their own names for the doll reminded me of Beskow's Rumpelstiltskin. Henkes' mice are cute, and he is in full control of this franchised style. White space breaks up small passages of text within small chapters to make it more approachable for a young reader. More animals that don't use any animal traits. This is a follow-up to Penny and Her Song. A fun early reader and I think this second one might even be better than the first one. Very sweet and charming. This reminds me of my oldest niece whose beloved doll took a long time to settle on a name. One of her previous names was similar to the name Penny chooses for her doll! Penny and Her Doll begins in the setting of a garden. Mama and Penny are in the garden smelling roses and pulling weeds when the mailman delivers a package. The package is for Penny from her Grandma. When she opens the package, there is a sweet note and a gift wrapped in pretty paper. The note was to explain that Grandma was at the store and thought of Penny when she saw this doll. When Penny unwrapped the pretty paper, there was a doll that she loved dearly. She showed everyone her new toy and Penny and Her Doll begins in the setting of a garden. Mama and Penny are in the garden smelling roses and pulling weeds when the mailman delivers a package. The package is for Penny from her Grandma. When she opens the package, there is a sweet note and a gift wrapped in pretty paper. The note was to explain that Grandma was at the store and thought of Penny when she saw this doll. When Penny unwrapped the pretty paper, there was a doll that she loved dearly. She showed everyone her new toy and took it everywhere. However, Papa asks what she named the doll and Penny was shocked that she forgot to give her a name. She then thought and thought of a name until she became frustrated. Penny went outside and began to smell the roses, just then she realized something! The dolls name should be Rose because she was smelling roses when the mailman delivered her. Henkes writes little girl characters really well. Penny's behavior toward her new doll is perfect and I love the way the text repeats key phrases from mom and dad. I wish that Penny's doll was the same color as her family. I know I may be hyper-sensitive, but some little girls have trouble finding dolls that represent their own colors and cultures. Bought this for nostalgia and will love it for always. I would expect nothing less from Kevin Henkes. This is a sweet story about how we name the things we love. Henkes does a wonderful job of showing how sometimes we just need to have a little faith and stop trying so hard. My 3 and 4 year old enjoy listening to these books. While they are beginning reader books, they don't feel babyish and have solid language. Easy to follow stories, but not oversimplified. One of my favorite Penny stories - she gets a new doll and searches to find the perfect name. It was great until the last page where the mother character tells her daughter 'now you don't have to think so hard' and Penny carefully thinks about a meaningful name to give her doll. The triplets loved guessing correctly what Penny ended up naming her doll. Very engaging for them. I liked Gigi and Buppy to you. Now I like it but not so much, only to infinity. Fairly cute book about a mouse getting a new doll and thinking up a name. Read it to non-native English speakers at church. Penny got a box from her grandma. She opened it. Inside was a nice doll. She couldn't figure out a name for it. Finally, she found the perfect name. The color scheme and exterior design of Kevin Henkes's picture books is almost always what catches my attention first about them. As an artistic planner, he really knows how to mix attractive pastels in subtle yet stirring beauty, juxtaposing shades that work perfectly in alignment with each other to give a broad sense of aesthetic pleasure. If there's a better author/illustrator when it comes to this aspect of the picture-book experience, I have yet to come across his or her work. Kevin Henkes The color scheme and exterior design of Kevin Henkes's picture books is almost always what catches my attention first about them. As an artistic planner, he really knows how to mix attractive pastels in subtle yet stirring beauty, juxtaposing shades that work perfectly in alignment with each other to give a broad sense of aesthetic pleasure. If there's a better author/illustrator when it comes to this aspect of the picture-book experience, I have yet to come across his or her work. Kevin Henkes stands head and shoulders above the rest in so many ways. Surely Penny still remembers her song, the one she learned and recited for her parents and baby siblings in Penny and Her Song, but a new source of immediate interest enters her life when a package arrives carrying a gift from her Gram. Enclosed is a doll bedecked in pink, and Penny loves her right away. She carries her new doll around to show to the members of her family, but it isn't until Papa inquires about the doll's name that Penny realizes she hasn't thought of one. Everybody has to have a name, especially well-loved dolls like Penny's gift from Gram. But what if Penny isn't up to the task of selecting a given name for her new doll? What if the doll sits there waiting for a name forever, and Penny can never think of just the right one? Mama and Papa are sure a fitting name will occur to Penny sooner or later, but Penny isn't as confident; that is, until she takes her doll back to where their young friendship started, and a moment of inspiration at last gives Penny the perfect name for her doll. Sometimes when the moment is right and everything goes just the way it's supposed to, all that's left is to embrace it. Penny and Her Doll gently demonstrates that our most determined efforts don't always yield corresponding results. If we try to force our brain to do its work right now when what it really needs is time to process our request, we might not find ourself satisfied with what the computer produces. The computer is a marvelous one, however, capable of maneuvers beyond our greatest expectation, and given time and space to operate to full capacity, it can eventually handle just about any problem we throw at it. Even one as important as assigning a name to a pink-cheeked doll. This charming Henkes title is an easy read designed for a level two or three reader. Illustrated throughout with Henkes charming drawings of Penny and her family of mice, the drawings closely follow the text and provide lots of picture clues to help the reader along. The book is structured in three chapters. In the first, Penny is gardening with her mother and gets a package from her grandmother which turns out to be a doll. Henkes captures the joy of a child receiving an unexpected gift. Penny’s This charming Henkes title is an easy read designed for a level two or three reader. Illustrated throughout with Henkes charming drawings of Penny and her family of mice, the drawings closely follow the text and provide lots of picture clues to help the reader along. The book is structured in three chapters. In the first, Penny is gardening with her mother and gets a package from her grandmother which turns out to be a doll. Henkes captures the joy of a child receiving an unexpected gift. Penny’s mother makes her read the note in the package first, implicitly teaching young children what is polite behavior. The second chapter concerns Penny’s dilemma about naming the doll and the third brings resolution when Penny decides on a name. The text models good behavior on the part of Penny and her parents. Penny is worried she won’t be able to think of a good name for her doll but her parents are reassuring, and confident that Penny will come up with something. The book functions well as a read aloud or for a child who wants to read to herself. The simple repeated phrases reinforce learning and contribute to confidence in learning to read. There is also a gentle humor in the book which will appeal to young readers. Penny’s mother is weeding and remarks that there are a lot of weeds. Penny says there are a lot of flowers. I like the way this shows a difference of perception between the two generations. The pastel colors and simple line drawings and watercolor (?) wash are calming and would help children who might be anxious about reading. The typeface is large and there are a limited number of words on each page. There is also plenty of white space and the illustrations predominate. The denouement in which Penny decides on a name for her doll will also appeal to children who need to find their own power and trust in it. Indeed the book delves in its own way into the power of naming. Henkes, K. (2012). Penny and her doll. New York, NY: Greenwillow Books. While in the garden, the mailman delivers a delightful gift to Penny. It’s a beautiful and very pink doll! Penny ponders many names for her new family member and comes up with the perfect idea. 4.4.6 Evaluate own ability to select resources that are engaging and appropriate for personal interests and needs. This book might be recommended to young girls in primary grades who would enjoy a story about a doll. Reading Penny and Her Doll makes me definitely want to add the first novel Penny and Her Song to my wishlist. Penny is an adorable character. I love the family interaction with Mama, Papa, Penny and the twins. This is also a lovely book. The shades of pink and purple with greens is very attractive to the eye. I really enjoyed this ARC and I will be putting this on my wishlist for keeps as well as other Kevin Henkes books. Penny and Her Doll would make a great grandmama gift accompanied with a dol Reading Penny and Her Doll makes me definitely want to add the first novel Penny and Her Song to my wishlist. Penny is an adorable character. I love the family interaction with Mama, Papa, Penny and the twins. This is also a lovely book. The shades of pink and purple with greens is very attractive to the eye. I really enjoyed this ARC and I will be putting this on my wishlist for keeps as well as other Kevin Henkes books. Penny and Her Doll would make a great grandmama gift accompanied with a doll to a sweet granddaughter in one's life, but as a story it is enjoyable for all. Penny and Her Doll is another wonderful novella by Kevin Henkes. This cute story features Penny, one of Kevin's many mice in characters in his authors collection, who receives a gift from her Gram in the mail. It's a wonderfully rosy pink doll that Penny just adores, but has no idea what to name! She thinks and thinks and finally decides on Rose, after she returns to the garden she visited when she received the package. 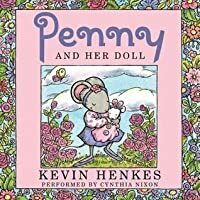 This is one of my favorite Henkes books because Penny is so sweet, lovabe, a Penny and Her Doll is another wonderful novella by Kevin Henkes. This cute story features Penny, one of Kevin's many mice in characters in his authors collection, who receives a gift from her Gram in the mail. It's a wonderfully rosy pink doll that Penny just adores, but has no idea what to name! She thinks and thinks and finally decides on Rose, after she returns to the garden she visited when she received the package. This is one of my favorite Henkes books because Penny is so sweet, lovabe, and relatable for young girls. What: This is an excellent book for students who are just getting into chapter books by themselves. This book is about Penny receiving a new doll from her grandmother. Penny and her mother are working in the garden and Penny is admiring her favorite flower the rose, while her mother is picking weeds. She receives a package from her grandmother and it is a new doll. She immediately loves the doll realizes that she must come up with a name for the doll. No matter what she thinks of or suggestions What: This is an excellent book for students who are just getting into chapter books by themselves. This book is about Penny receiving a new doll from her grandmother. Penny and her mother are working in the garden and Penny is admiring her favorite flower the rose, while her mother is picking weeds. She receives a package from her grandmother and it is a new doll. She immediately loves the doll realizes that she must come up with a name for the doll. No matter what she thinks of or suggestions from family, she cannot find a name that fits. She finds her way back to the garden and admires the roses once again. Then it hits her...Rose is the perfect name for her doll. So What: Students should have a daily journal where they keep their thoughts and practice their literacy skills. Now What: After reading this book, students will take their journals home with them and ask their parents how they got their name. They will retell the story in their journal and how the story makes them feel. Penny and Her Doll is about a small mouse named Penny who gets a new doll mailed to her from her grandmother. Penny is so excited to have the doll however she has a very difficult time coming up with a name. I really enjoyed this book because of its illustrations and how many little girls can relate to Penny's conflict. However, for little boys this story may not interest them as much as it would for the girls. I think Kevin Henkes is very creative with merging everyday life situations into char Penny and Her Doll is about a small mouse named Penny who gets a new doll mailed to her from her grandmother. Penny is so excited to have the doll however she has a very difficult time coming up with a name. I really enjoyed this book because of its illustrations and how many little girls can relate to Penny's conflict. However, for little boys this story may not interest them as much as it would for the girls. I think Kevin Henkes is very creative with merging everyday life situations into characters who are animals. I think children would really like this book because its easy to read and follow. Teachers could most definitely read this book aloud to their students and create various activities that center around the plot and conflict of the story. The illustrations are colorful and bright and follow the story as if the words don't exist. I must say Kevin Henkes is my favorite author/illustrator. Another great early reader! I like the potential discussion about names and how children get their names. I also think that many children can rel When Penny receives asurprise box in the mailfrom Gram, she is thrilled.The surprise is a doll,and she is absolutely perfect,from her head to her toes.Penny loves her immediately.She introduces her new dollto Mama and to the babiesand to Papa. But then Papaasks what the doll's name is,and Penny realizes thatshe doesn't know. This was a nice little follow-up to Penny and Her Song, and I think Penny is going to have quite a following with young kids. I liked this one a bit better than the first book, maybe because the subject matter just seemed a bit... inane in Penny and Her Song. Penny and Her Doll is just the simple story of Penny trying to find a suitable name for her doll. I like the illustrations, and the purple and pink color scheme is just lovely. New readers will enjoy Kevin Henkes's newest mouse, Penny. When she receives a surprise box in the mail from Gram, Penny is thrilled. The surprise is a doll, and she is absolutely perfect. "I love her already," Penny says to both her mom and dad. But Penny's delight turns to worry when she realizes she doesn't have a name for this perfect doll. 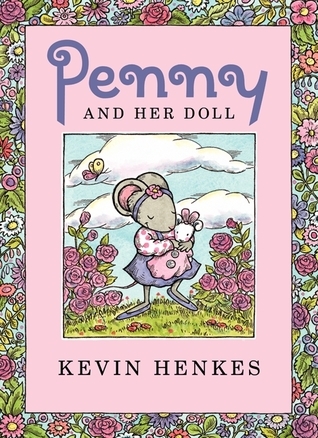 Henkes's natural but controlled storytelling and warm illustrations in both Penny books (Penny and Her Song is the first book) are perfect for new reader New readers will enjoy Kevin Henkes's newest mouse, Penny. When she receives a surprise box in the mail from Gram, Penny is thrilled. The surprise is a doll, and she is absolutely perfect. "I love her already," Penny says to both her mom and dad. But Penny's delight turns to worry when she realizes she doesn't have a name for this perfect doll. Henkes's natural but controlled storytelling and warm illustrations in both Penny books (Penny and Her Song is the first book) are perfect for new readers.